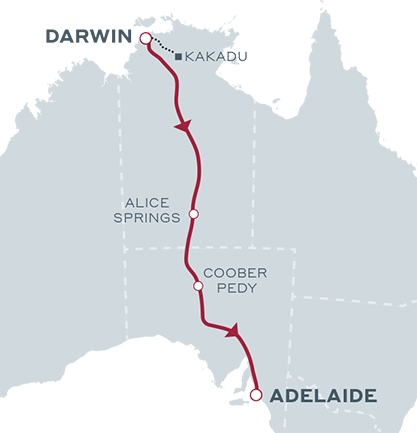 Explore spectacular Litchfield National Park, see the famous jumping crocodiles along with a host of other popular Top End attractions before stepping aboard The Ghan Expedition in Darwin and experiencing the wonders of Katherine, Alice Springs and Coober Pedy on your way to Adelaide. Take in the splendour of thundering falls, rainforest pockets and sacred historic sites of Litchfield National Park. Discover the incredible architecture of the termite mounds. View the spectacular double waterfalls of Florence Falls. Marvel at the water cascading down into the deep waterhole at the base of Tolmer Falls. Swim in the rock pools of Wangi Falls. Get up close to the prehistoric crocs. Be impressed by the amazing array of native birdlife. Visit the Window on the Wetlands Visitor Centre. Enjoy superb views across the Marrakai Plains and the Fogg Dam Conservation Reserve. Based on The Ghan Expedition Year End Expedition Speical. Conditions Apply.